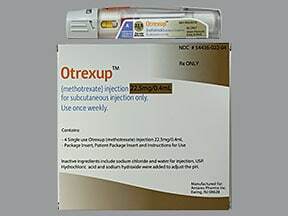 Who should not take Otrexup Auto-Injector? 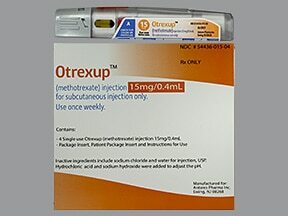 What conditions does Otrexup Auto-Injector treat? 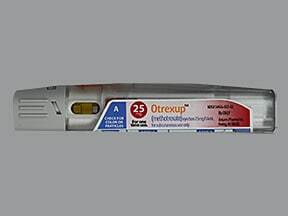 Tell your doctor right away if you have any serious side effects, including: mouth sores, diarrhea, signs of anemia (such as unusual tiredness, pale skin), signs of liver problems (such as dark urine, persistent nausea/vomiting, stomach/abdominal pain, yellowing eyes/skin), easy bruising/bleeding, black stools, enlarged glands/lymph nodes, bone pain, unusual pain and discoloration of the skin, signs of kidney problems (such as change in the amount of urine), dry cough, muscle weakness. Get medical help right away if you have any very serious side effects, including: irregular heartbeat, vision changes, weakness on one side of the body, severe headache, neck stiffness, mental/mood changes, seizures. 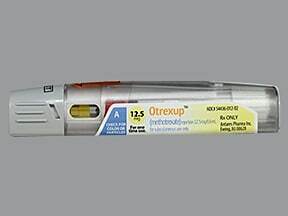 List Otrexup Auto-Injector side effects by likelihood and severity. 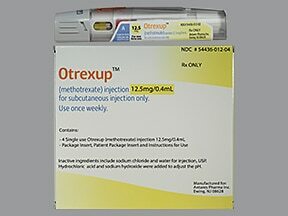 Before using this medication, tell your doctor or pharmacist your medical history, especially of: liver disease, kidney disease, lung disease (such as pulmonary fibrosis), alcohol use, suppressed immune system, blood cell/bone marrow disorders, certain stomach/intestinal diseases (such as peptic ulcer, ulcerative colitis), any active infection (including chickenpox or recent exposure to it), folic acid deficiency. 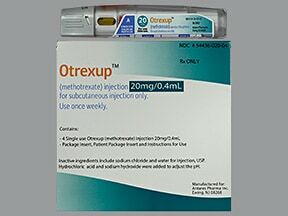 Methotrexate must not be used during pregnancy. It may harm an unborn baby. It is important to prevent pregnancy during and after treatment with methotrexate. Therefore, males and females must use reliable forms of birth control (such as condoms, birth control pills) during treatment. 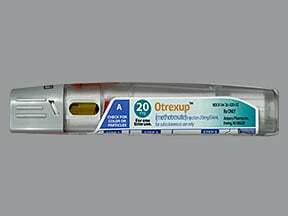 Males should continue to use birth control for at least 3 months after the end of treatment. Females should continue to use birth control for at least 1 menstrual cycle after the end of treatment. If you become pregnant or think you may be pregnant, tell your doctor right away. 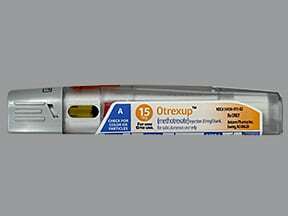 What should I know regarding pregnancy, nursing and administering Otrexup Auto-Injector to children or the elderly? 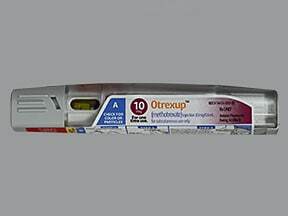 Some products that may interact with this drug include: acitretin, asparaginase, chloramphenicol, leflunomide, other drugs that can cause kidney problems (such as cisplatin), other drugs that can cause liver problems (such as azathioprine, sulfasalazine, retinoids such as isotretinoin), penicillins, phenytoin, probenecid, procarbazine, pyrimethamine, sulfa medications, tetracyclines. 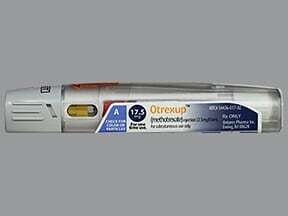 Does Otrexup Auto-Injector interact with other medications? 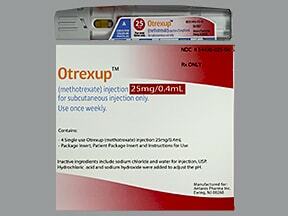 Are you taking Otrexup Auto-Injector? 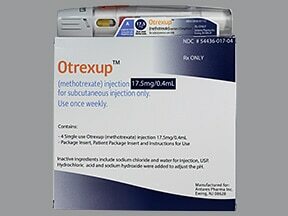 Are you considering switching to Otrexup Auto-Injector? 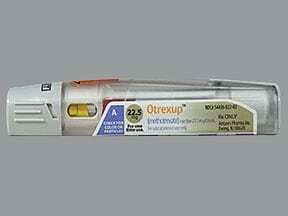 How long have you been taking Otrexup Auto-Injector?